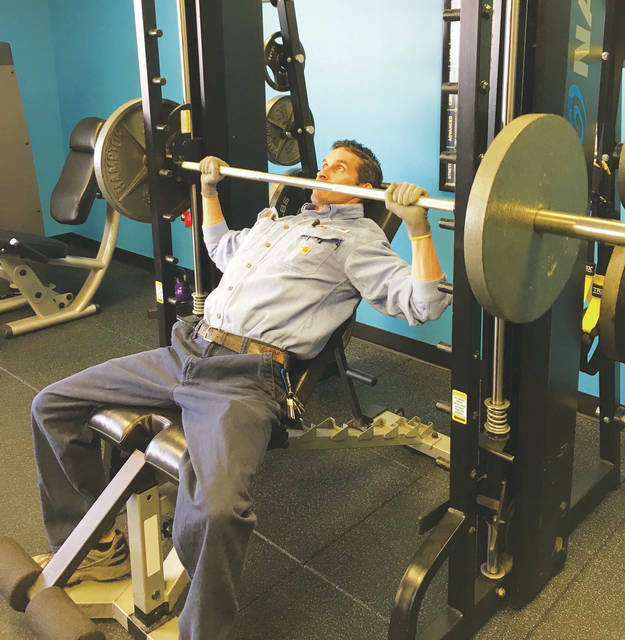 American Showa, Inc. employee Jeremy Flahive exercises in the Showa Fitness Center on his lunch break. Courtesy Photo | American Showa, Inc. The Healthy Business Council of Ohio (HBCO) will recognize 73 Ohio employers for healthy worksite practices during the 14th annual Healthy Worksite awards presentation on Thursday, Jan. 25. American Showa, Inc., based in Sunbury, is one of 16 recipients of the Gold Award for medium-sized businesses — employee workforce numbering 301 to 1,000.
https://www.delgazette.com/wp-content/uploads/sites/40/2018/01/web1_Associate-Bench-Pressing_AMSHOWA.jpgAmerican Showa, Inc. employee Jeremy Flahive exercises in the Showa Fitness Center on his lunch break. Courtesy Photo | American Showa, Inc.
For information and to register for the Health Action Council 2018 Columbus Symposium, visit www.healthactioncouncil.org. For information about the Healthy Worksite Award program, visit http://www.healthy.ohio.gov/HOBC.